This super moist banana bread with sour cream recipe is so delicious. The texture of the bread is soft with a slightly crispy and flaky top and has been voted the best banana bread by my family. You can stop your search for the world’s best banana bread. By landing on this post, you have found it, my friends. This banana bread with sour cream is PERFECT. Oh. My. Goodness. Moist. This is a very moist banana bread, with 3 mashed bananas, sour cream, and a 1/2 cup oil. Being able to taste the texture of the mashed bananas. And, check. There’s something about the mix of the sour cream with the sweet bananas that just works so fabulously well. Note: the recipe says to not overmix. This is key to maintaining the various yummy textures. Slightly crispy top to balance out the moist banana bread goodness in the core of the loaf. Easy to whip up in One Bowl, which translates to: this will be made often in my house. The combination of mashed ripe bananas and sour cream is to die for. Not only for making it a moist bread, but also to balance out the sweetness of the bread. Its a perfectly flavored bread, and my family LOVES it. A banana bread with sour cream and oil might sound like the greasy factor may be too much. Not the case here. It is only a half cup oil, and proves to be the perfect amount to work with the bananas and sour cream for moistness. SAVE THIS BANANA BREAD WITH SOUR CREAM TO YOUR “BREADS” PINTEREST BOARD! This moist banana bread with sour cream recipe is so delicious. The texture of this bread is soft with a slightly crispy top and is voted the best banana bread by my family. Grease and lightly flour a 9x5 loaf pan. In a large bowl, whisk together the sugar and oil. Add in the eggs, mashed bananas, sour cream, and vanilla. Mix and blend well. Add the flour, baking soda and salt into the bowl. Stir the dry ingredients together a bit while on top of the wet ingredients, then using a wooden spoon, mix the dry ingredients into the wet ingredients just until moistened. Do not overmix. Bake for 50-60 minutes, until toothpick inserted in center of loaf comes out clean. It only took 50 minutes for my loaf to be fully cooked. Cool for 5 minutes in the pan, then gently turnout the loaf onto a cooling rack and cool completely. Store covered at room temperature. I’m going to make this, this afternoon. I’m going to add 1/2 cup = diced, dried Apricots & 1 cup = chopped & toasted Pecans ! YUM !!! My hubby loves Apricots & they should be Great in this !!! Those sound like delicious additions! Please let me know how it turned out. Thanks so much for stopping by! Have your tried baking and freezing for later use?? I have made this and love the recipe!! Trying to decided if I attempt to freeze or just make closer to the event I want them for (I make muffins)! I’m so glad you’re enjoying the recipe! I have not tried freezing this particular bread, but I’m sure it would work well. Enjoy! 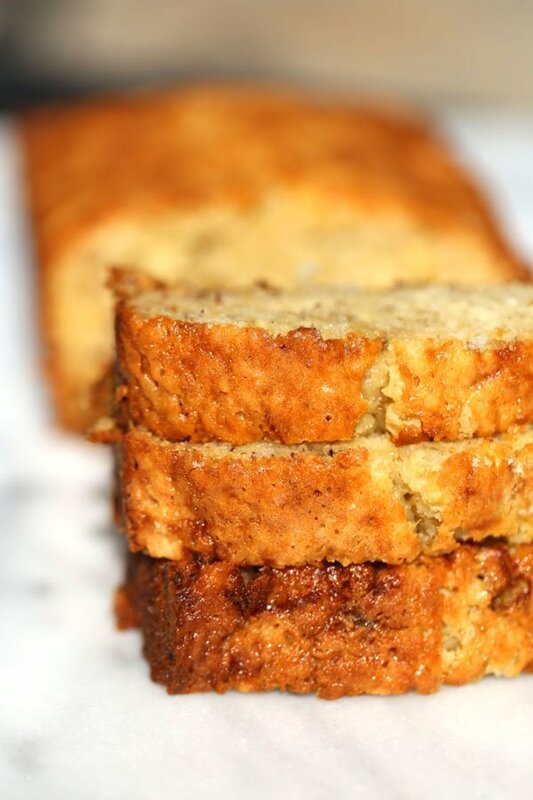 This recipe for Banana Bread recipe is delicious…..so moist. It’s the best. Will always use this recipe! Thanks for sharing. You just made my day! I’m so glad to hear you enjoyed it. We make this recipe often and always love it as well. Thank you so much for checking in! 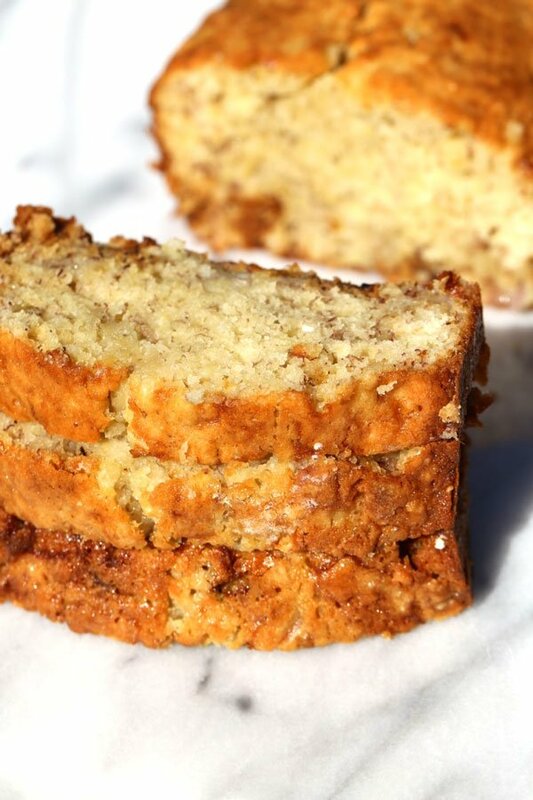 This banana bread is so tasty! I’ve made it twice. I’ve also added a cup of semi-sweet chocolate chips and pecans. Wow, what a combination. I use a little less than a cup sugar. I also like to make it in small aluminum pans to give away. SO glad you enjoyed it. This is one of our favorite recipes. Love that you added chocolate chips and pecans to the bread – great additions for taste and texture! Have you made this recipe for muffins? Yes, and they’re yummy! Preheat oven to 350 degrees. Pour 2/3 cup dough for each muffin in a lined muffin tin. Cook for 25-28 minutes, until a toothpick inserted in center of muffin comes out clean. Enjoy! Can you use apples in the place of the bananas? Or canned pumpkin, these are my favorite flavors for desserts. I have only made this recipe with bananas. I would think the recipe would work with chopped apples, but not as well with canned pumpkin. Sour cream with canned pumpkin might be too much moisture. I will try this with apples soon and let you know if it works – could be a nice variation! Thanks for checking in!